I have occasionally followed your meal plans but this week I used the shopping list and made most of the meals. I have to say there were some surprises I thought I wouldn’t care for but ended up really liking the recipe. One in particular was the PB&J yogurt. It was much more satisfying than expected (I used PB2 instead of peanut butter)Keep the plans coming! 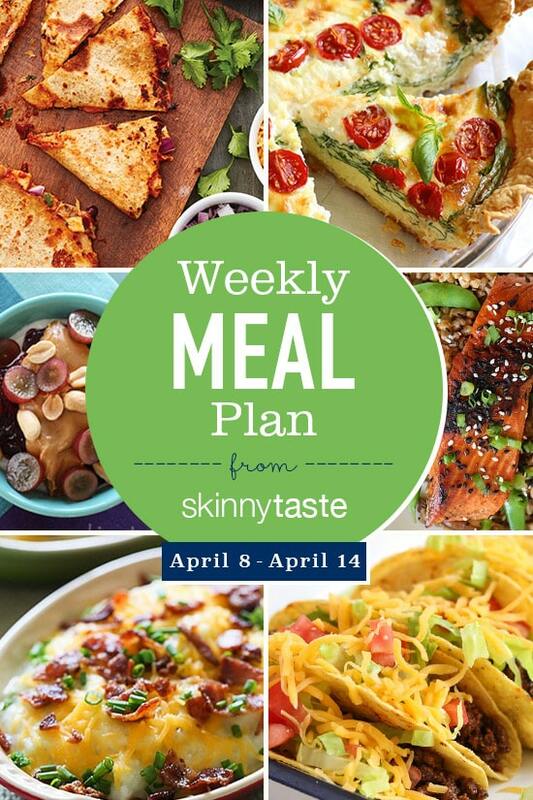 Gina – Just wanted to thank you so much for your meal plans & all the work you do! My husband and I have recently started following your plans, in an effort to lose some weight, and every day when I tell him what we’re having for dinner, he says “we LOVE Gina!” And we do! – thank you for all you do! Thank you for this meal plan. I use them every week. It was so nice to meet you yesterday. Chicken Shawarma salad is one of the first recipes I ever made of yours. Nice way to start out such a Spring week. As a newlywed I love these meal plans to help me learn new recipes to feed us both! Thank you for the great meal plans and recipes! Your emails are always anticipated. I am eating great food and losing weight at the same time. Love love love Skinnytaste. Makes meal planning so much easier. We love every meal we have tried. Thanks for sharing! I especially love the chicken shawarma salad recipe. It’s so good! I appreciate your meal plans, thanks Gina! I use your recipes constantly and always plan to use the meal plans I just haven’t gotten in gear yet. Please keep making them though, they’re wonderful! I don’t like the taste of cilantro, is there something I could use to replace it? Thanks. I love your meal plans! 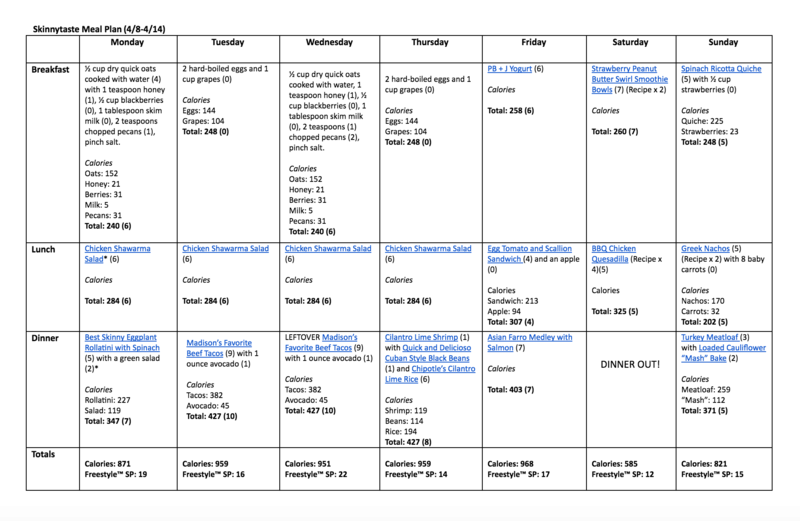 Every week, when I’m menu planning, I always check out your meal plans! Love the inspiration! I get into a rut especially with breakfast and lunch and find these plans chock full of great ideas for switching it up. I use them every single week! Thank you so much for putting them together!! Hi i am a diabetic and need to eat more protein to keep blood sugar level. Do u have diabetic meal plan? Sorry, not at this time. Nutrition info in listed on each recipe though! Please continue with the meal plans…I love them!